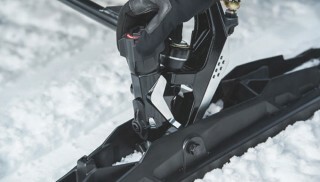 BRP has developed a quick way to change the handling of a Ski-Doo mountain snowmobile with the flip of a lever. Riders can choose more or less chassis transfer to keep their skis higher or lower depending on snow conditions, terrain or riding style. The tMotion Adjustable Limiter Strap’s slim design fits tightly along the running board without intruding on the rider’s feet. 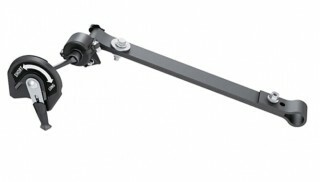 It uses a unique spring-loaded cam to shorten or lengthen the limiter strap, which allows the lever to be very compact because it doesn’t directly move the strap. The net effect between short and long positions is significant; equal to two hole positions on a conventional limiter strap adjustment, letting a rider tune their snowmobile’s handling effortlessly. The tMotion Adjustable Limiter Strap is a bolt-on accessory for 2016 models with tMotion rear suspensions, and can be retrofitted to earlier tMotion equipped machines with the addition of a new front suspension arm – the kit will be offered in both 2016 and pre 2016 configurations. Visit www.store.ski-doo.com for information on BRP clothing and accessories.